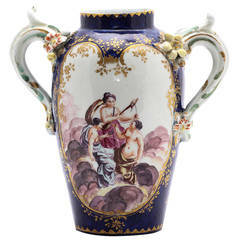 Large Coalport vase, the classic form made extraordinary by large birds head handles rising to the lip with classical mask beneath, well decorated with panels of colorful flowers on a blurred scale-blue ground. Unmarked, circa 1805. Verified and glazed porcelain in white or blue with optional decorations in blue or white. Accolay vase, circa 1960 with printed and striated decoration typical of "Gallic" models inspired by Gallic archeology pieces preserved in the Avalon museum.